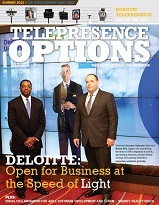 The cover story for the 2013 Telepresence Options Magazine is deep dive into the Deloitte video communications network and is available below for free, in its entirety. 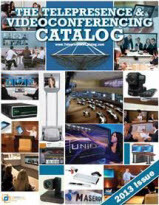 The article provides an inside look at how Deloitte is connecting to 185 companies a month, generating revenue from their video program, saving their clients money, and making their expertise available globally. This is the most in-depth look at a Fortune 100 visual collaboration program ever.